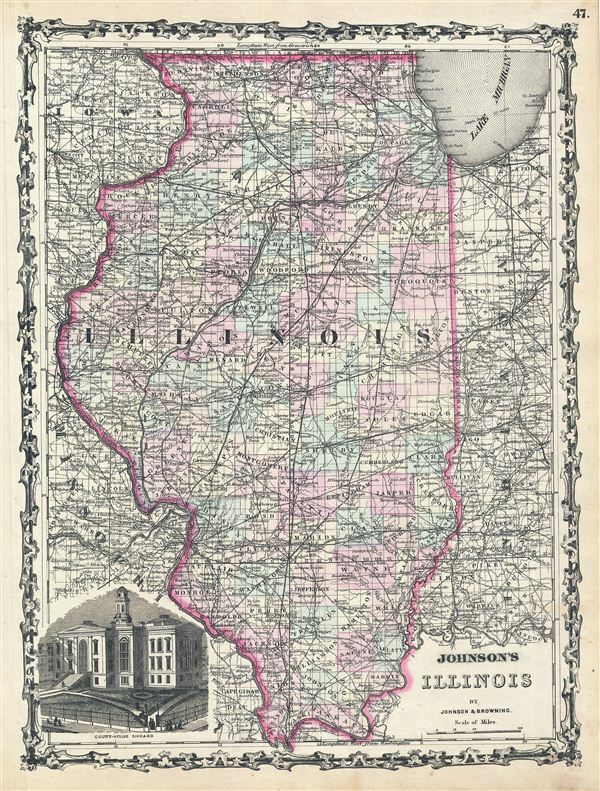 This is a beautiful example of A. J. Johnson and R. Browning's 1861 map of Illinois. It covers the entire state as well as portions of the adjacent states of Iowa, Missouri and Indiana. The map is color coded according to county and notes several towns, cities, rivers, railways and various other topographical details. It features the strapwork style border common to Johnson's atlas work from 1860 to 1863. Published by A. J. Johnson and Browning as plate no. 47 in the 1861 edition of Johnson's New Illustrated Family Atlas. This is the last edition of the Johnson Atlas to bear the 'Johnson and Browning' imprint. Subsequent editions reflect Ward's 1862 acquisition Ross C. Browning's shares in the firm.